Henry Stoneson's obituary captures the legacy of these two brothers: "Mr. Stoneson was given credit for a new concept in buildings---the city within a city." Henry (1895-1958) and Ellis (1893-1952) Stoneson created major housing and shopping near San Francisco's Lake Merced. The Stoneson Development Corporation built close to 25,000 homes in the Bay Area and became one of the nation's largest home building companies. Born in Victoria, Canada (the sons of immigrant Icelanders) the Stoneson Brothers arrived in San Francisco in 1920 and started building houses on a small scale. Business increased during the Depression with the liberal lending policies of the Federal Housing Administration, and later the Stonesons benefited greatly from government funding to create wartime housing during World War II. In the late 1930s they started work on the Lakeside development, a strip of immaculate homes served by a small commercial section (Lakeside Village). In Lakeside, both brothers constructed personal mansions: Ellis at 30 Stonecrest Drive and Henry just down the street at 100 Stonecrest Drive. In 1949, the brothers took the ideas of Lakeside a giant step further. Across 19th Avenue they broke ground on Stonestown. Featuring over 700 apartments next to a major shopping center of some 75 businesses, a medical building, grocery store, and eventually a theater, Stonestown attempted to be a self-contained community within a major city. Both served as presidents and directors of various local and national home builder and contractor associations. 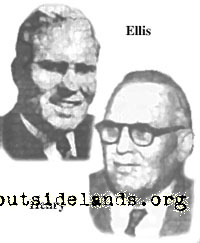 On the cusp of their greatest success, the opening of Stonestown in 1952, Ellis died of a heart attack at only 59 years of age. Younger brother Henry passed away just a few years later. Because of their proclivity for sneaking derivatives of "Stone" into their street names and developments, the Stoneson brothers made sure San Francisco couldn't forget their work. Sources: San Francisco Chronicle, August 24, 1952, December 31, 1958. Image: Created from San Francisco Chronicle, August 24, 1952, December 31, 1958.